For many of us, going out of town and leaving our feline friends behind can be worrying. That’s why choosing the right boarding situation is so important to your peace of mind. You deserve to enjoy your time away...and so does your cat! While nothing can match the care you provide in your own home, we provide a safe, stimulating, and medically supervised boarding experience for your cat. Since we board just cats, your feline is never threatened or bothered by dogs. All boarders are required to be up-to-date on vaccines, flea free (or we treat for fleas on admission), and have had recent exams at Exclusively Cats Veterinary Hospital. Your feline will be in a healthy environment while boarding with us. We look after the “creature comforts” by providing comfortable cat beds, clean litter, fresh water, and quality food. While you are welcome to bring food from home for your cat (and we recommend it if your cat requires a special diet), we have multiple diets available as well. We pay attention to the small, but important details. Does your feline like constant attention or would a “privacy screen” make her more comfortable? What type of bowls, bedding, or cage arrangement do they prefer? These are preferences we take note of, since it makes your kitty’s stay more enjoyable. Our felines are housed in the treatment area, right near where the staff works and takes breaks—not off in some back room or remote kennel. Your feline friend will be indulged with lots of love—cuddling, petting, and chin rubs, along with “person-to-cat conversations” throughout the day. (We like nothing more than the sound of rumbly purrs!) While a peaceful environment, the treatment room is also a hub. Your cat will enjoy stimulation and not grow bored or depressed waiting for the return of his or her human. 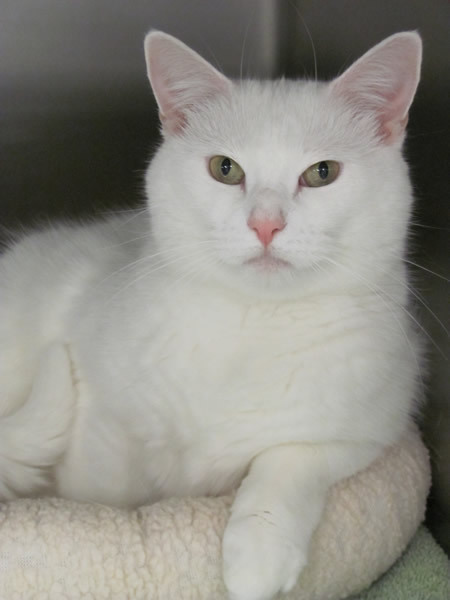 Unlike at many other kennels, guests of Exclusively Cats are cared for by a trained veterinary staff—the same professionals who assist Dr. Dunkle every day, and are experts in cat care. Veterinary professionals monitor your kitty’s eating, elimination, and behavior to ensure your cat thrives in our care. For existing patients, we provide medical boarding. Our services accommodate kitties with complex medical conditions and other special health needs. Whether your cat has diabetes, requires multiple medications, or is in need of some other form of monitoring, rest assured that he or she will be well cared for by Exclusively Cats Veterinary Hospital’s dedicated staff. Feline guests must be current on their rabies and feline distemper/calici-VS vaccinations. We also require a medical exam at Exclusively Cats within the year. Monitoring blood work needs to be up to date for cats with chronic health problems, so that Dr. Dunkle can address any specific health care needs that arise during your cat’s stay with us. 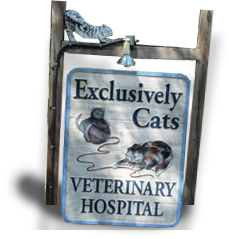 Reservations are required for boarding, so please contact us to arrange your cat’s stay.